The Howland fish bypass is nearly finished. It is the final leg in a $24 million restoration of the Penobscot River. 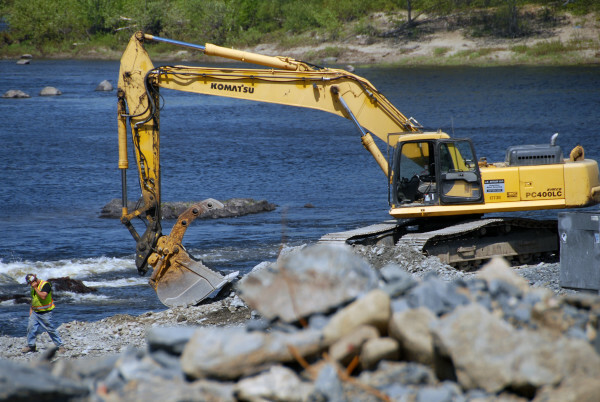 A backhoe operator takes a break from working on the Penobscot River Restoration Trust's fish bypass in Howland, May 27, 2015. HOWLAND, Maine — Atlantic Ocean-based salmon, sturgeon, American shad and alewives will be able to find spawning grounds in northern Maine for the first time in more than a century with the culmination of a 16-year project next spring, officials said this week. Engineers have been testing the Howland fish bypass since water began flowing through it Sept. 28. They are confident it will be ready for spawning season, said Laura Rose Day, executive director of the Penobscot River Restoration Trust. “Fish will be swimming above Howland into waters this spring that they haven’t been able to reach since the dams were put” on the river in the 1800s, Day said. “The moment of completion will be when everything is done in the spring, but this is the last piece to the puzzle to open fish passage from Penobscot Bay to the upper reaches of the Penobscot River, in particular the Piscataquis River watershed,” she said. Made up of a coalition of organizations, the restoration trust bought the Veazie, Great Works and Howland dams from PPL Corp. in December 2010 in a historic deal worth $24 million. Under an agreement brokered in 2004, PPL in return gained authorization to increase power generation at six other dams along the river, entirely offsetting the generation losses incurred when the three dams were decommissioned. 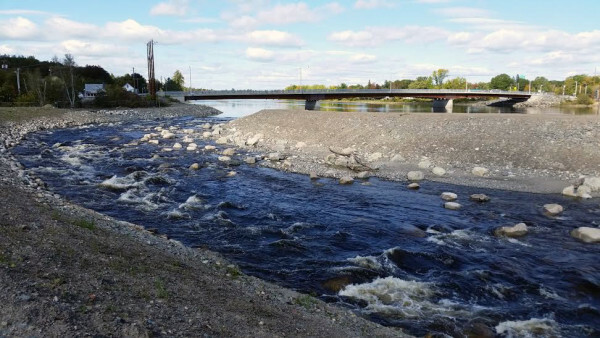 The bypass is part of the Penobscot River Restoration Trust’s plan to open nearly 1,000 miles of habitat to at least 11 fish species, including several endangered types. Those species help support other commercially important species, such as cod and lobster. The Veazie Dam was breached in stages during several months in 2013. 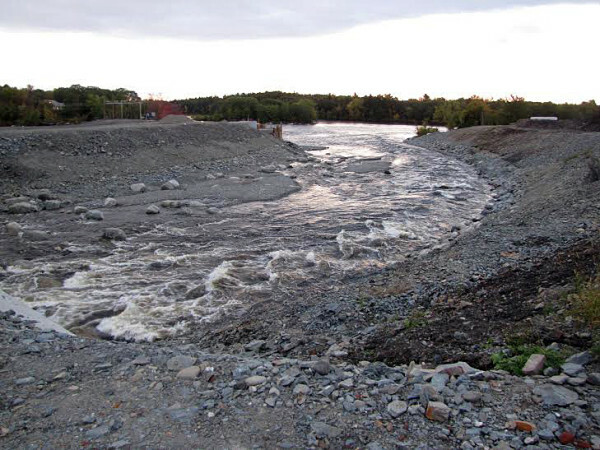 The Great Works Dam, which stretched across the Penobscot River from Bradley to Old Town, went down in 2012. The Howland Dam near the confluence of the Piscataquis and Penobscot rivers is bypassed and hasn’t generated electricity in years. The trust began work on the project in 1999, Day said. Results from initial fish counts through the first two dam sites have been encouraging, she said. The work has combined fairly well with town efforts to redevelop the town-owned site of a former tannery building adjacent to the bypass. Town officials are making good progress in negotiations to have the trust remove from the site large debris piles left by the project, Town Manager William Lawrence said. Some site cleanup has occurred in the last few weeks, Lawrence said. Both sides are hopeful the town land, once the site of the town’s largest employer, will be ready for commercial development in the summer. They also believe it will be a tourist attraction. “Howland has recognized that there is an opportunity here. I think people will be interested in leaving the highway [Interstate 95] to take a look at what this about,” Day said.